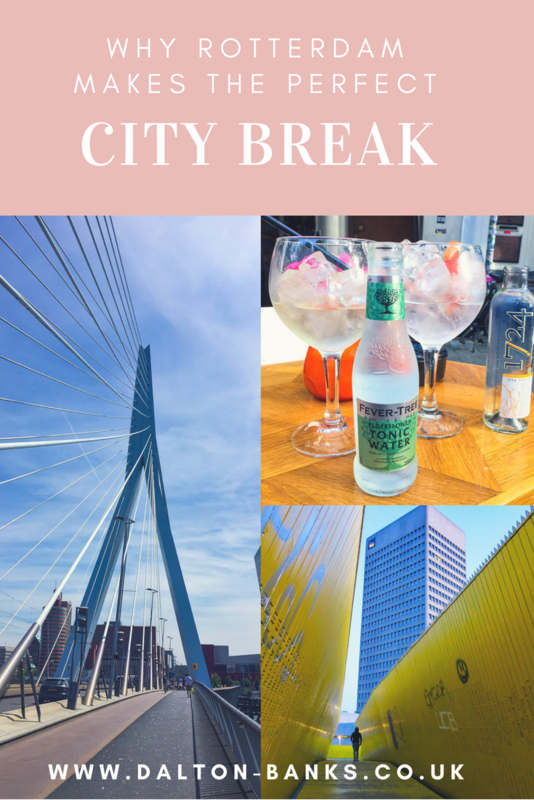 Last year I had an incredible summer of travel: I explored South America for three weeks and got to see Machu Picchu, I spent a sunshine filled weekend in Seville but the biggest and most pleasant surprise was Rotterdam. 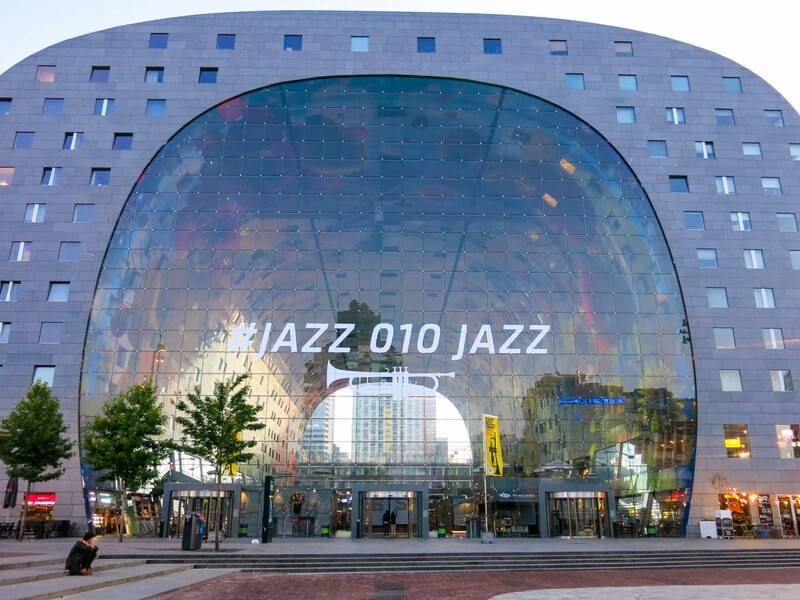 My husband and I were in Rotterdam for the weekend for the North Sea Jazz Festival (which by the way was an incredible festival), without this we would never have thought to visit this vibrant European city. 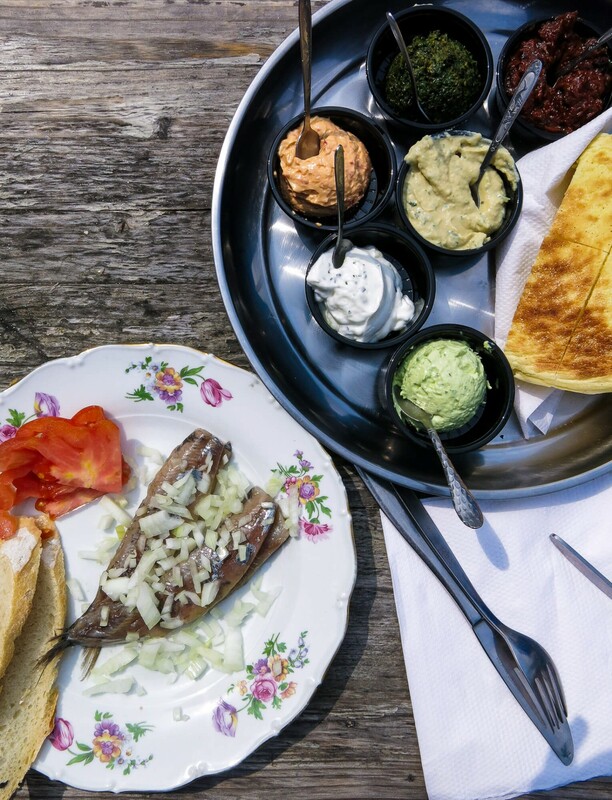 Rotterdam was named in Lonely Planet’s Top 10 Best in Travel in 2016 and I can see why. Rotterdam is Amsterdam’s cool little sister. 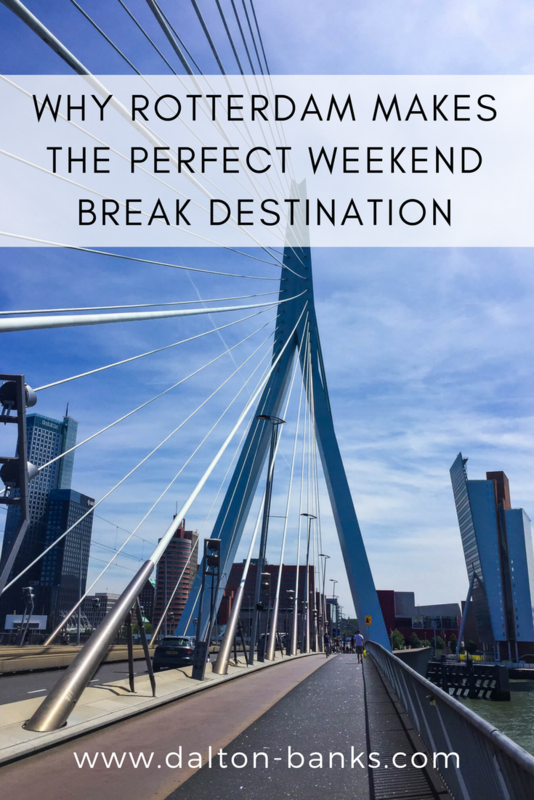 If you are looking for an alternative European city break then I can highly recommend this Dutch city! 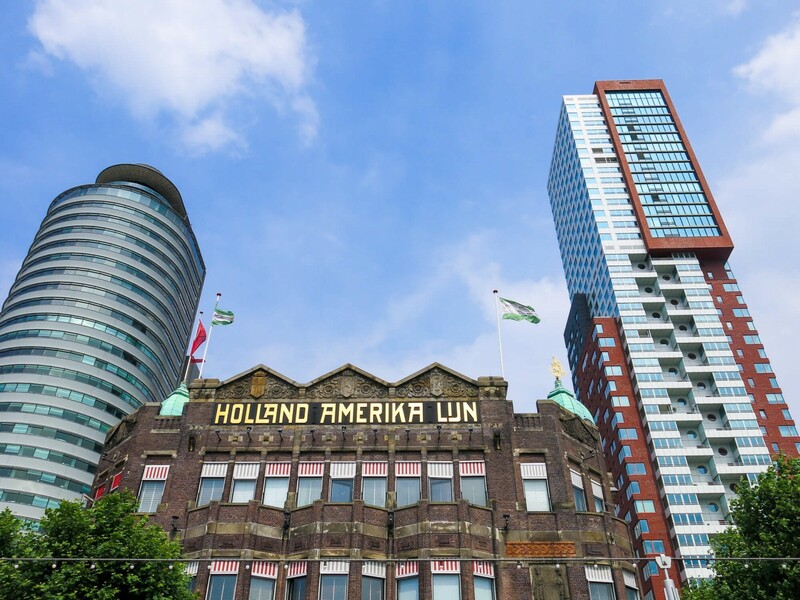 What sets Rotterdam apart from other European cities? 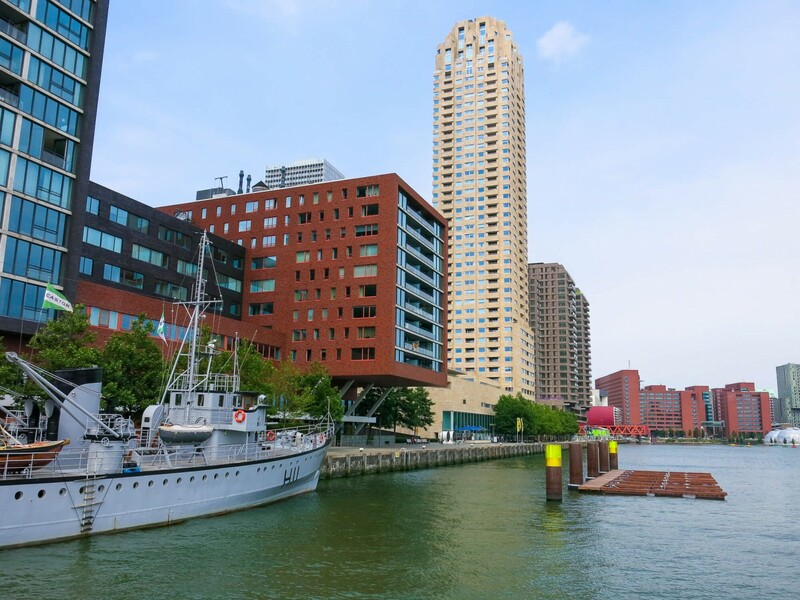 During the Second World War Rotterdam was almost completely destroyed and brought down to rubble. This was obviously incredibly devastating and they set to work quickly to rebuild their city. 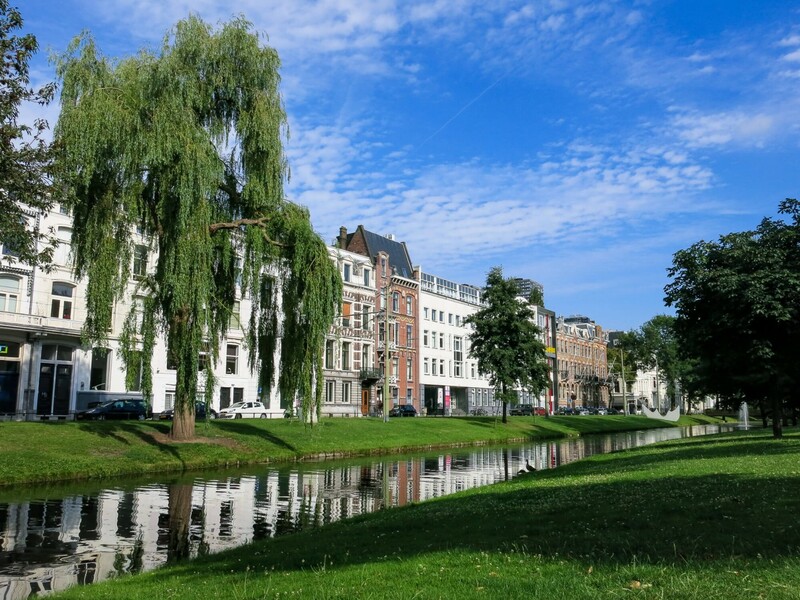 This led to the design of a brand new city that works in the modern age, which is why the architecture here is so different to the traditional feel of Utrecht and Amsterdam. Many of the European cities that are seen again and again in top 10 travel lists are old cities like Rome, Paris and Barcelona. Beautiful and important in their own ways, but in Rotterdam you can experience how a city should be built for the modern era. All the infrastructure works so well! Its a beautiful city with mainly modern architecture, although some of the suburbs are still full of traditional buildings. 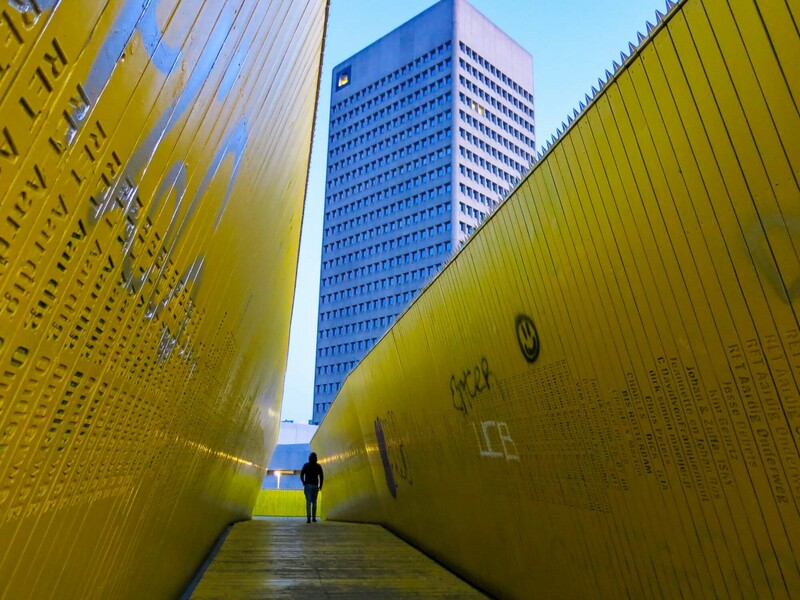 Rotterdam is a design led city full of iconic buildings. We loved the skyscrapers of all different shapes reflecting the Nieuwe Maas river surrounding them below. 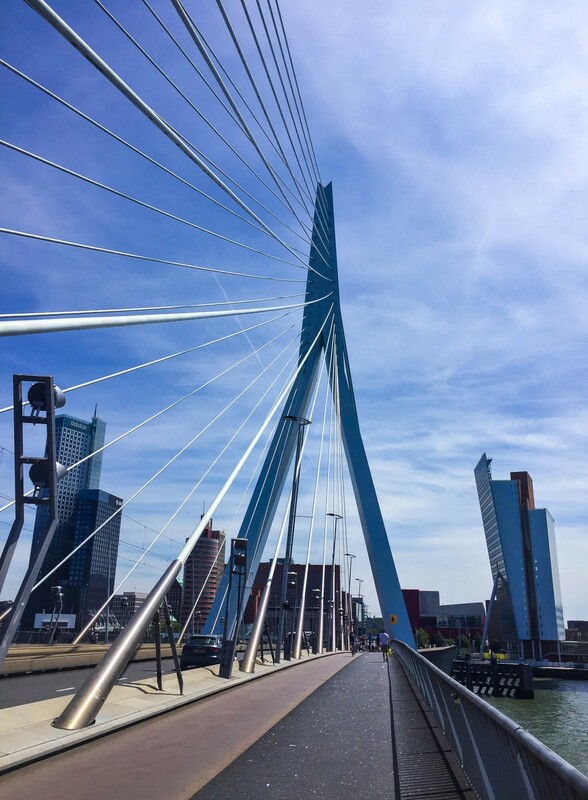 And don’t miss the Erasmus Bridge which connects the north and southern parts of the city. I think one of the reasons Rotterdam is unlike like any other European city I’ve travelled to is its design. For Londoners and most of the UK, Rotterdam is very close by and not expensive to travel to. If London based you can fly from City Airport with British Airways in just 50 minutes! 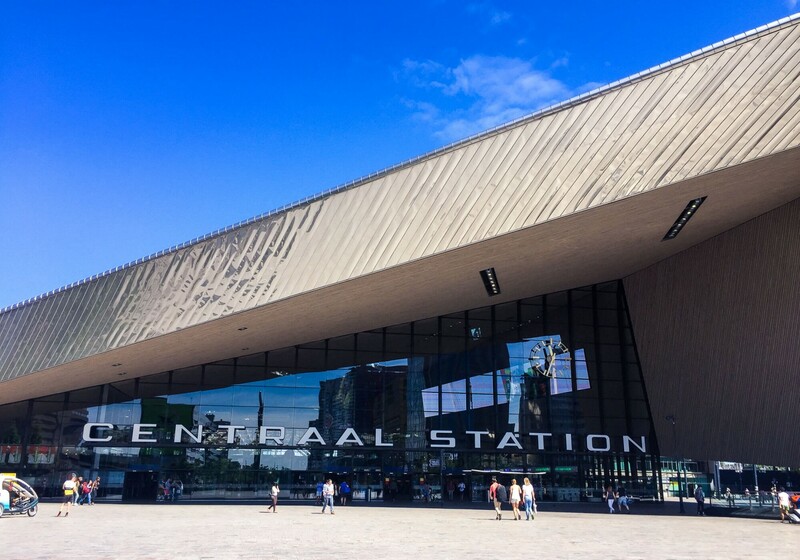 Or if you’re more conscious about using trains over planes you can be in Rotterdam in about 4 hours from St Pancras International train station. Oh and if you like Jazz (new or old, we were mainly there to see Jamiroquai!) then make sure you check out The North Sea Jazz Festival. It is one of the best music festivals I’ve ever been to. Every little detail has been though of, it offers an incredible range of live music and the crowd is a great mix of all ages. The locals make this city. Rotterdam is the friendliest city in Europe I have had the pleasure of visiting. 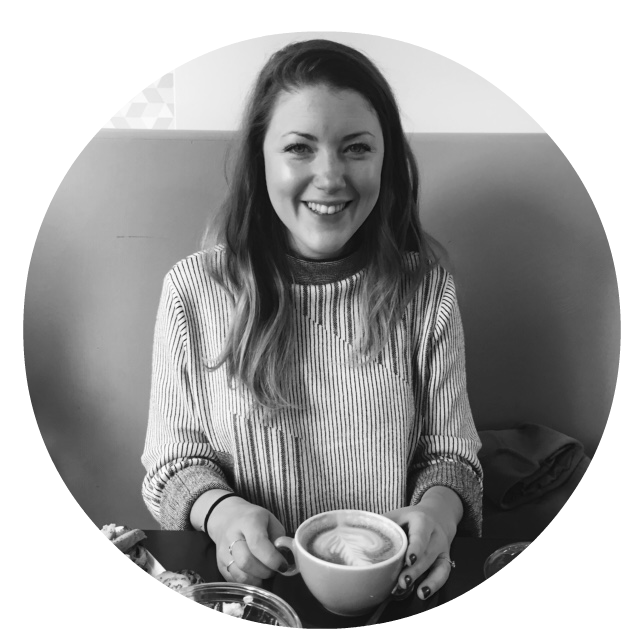 We couldn’t get over how welcoming and helpful people were, and everyone is always smiling! Food is always going to be one of the top reasons for me to travel somewhere! There is the famous Markthal. This interesting looking building houses an incredible array of different food stalls, restaurants, a supermarket and apartments that go the whole way around and look into the market hall. Artwork covers the ceiling of the arch making it a very vibrant place to explore. 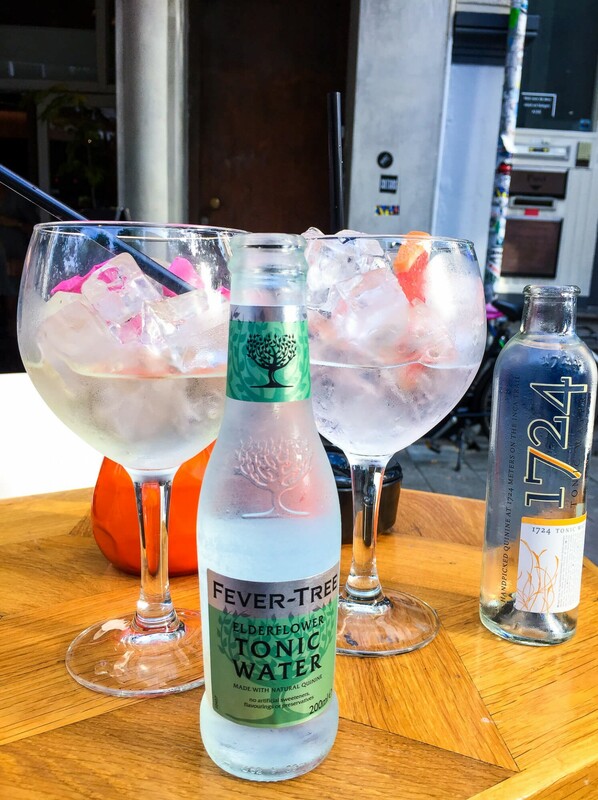 There are lots of great independent restaurants and a great food market down on the river in an old warehouse called Fenix Food Factory which is the perfect spot to spend an afternoon. I really do think the stunning architecture is one of the biggest draws of Rotterdam. We walked everywhere and loved coming across such an array of different looking buildings. Rotterdam is also home to a great selection of museums. The Museumpark lies in the centre of town, the location for a number of the best museums, and most of the others are within 15 minutes walk. There is a special combined ticket available which you can use to visit all museums in the Museumpark at a reduced price. There is a super cool looking photography museum down by the river, unfortunately it was closed on the day we went past, but definitely worth a look! Witte de Withstraat is Rotterdam’s most famous nightlife street: it is lined with restaurants and bars. We loved the vibe around here as there is a lot of outdoor seating so you can sip your cocktails whilst you people watch on a warm summers evening. All through the city there are some great bars for all different budgets. The neighbourhood bars are just as cool, dotted on street corners and open until late, we often had a nightcap in some cool little bar. We stayed in an Airbnb just to the north of the centre and it felt very much like East London. It is so easy to get around Rotterdam! You can get all over the city by bus, tram and metro. Or if its sunny like it was for us, you can walk. The city can easily be explored over two days! There is the option of a Hop on Hop off bus or there is also the historic tram line 10. Both will take you past many of the tourist attractions of Rotterdam and you can get on or off whenever you feel like it. There is also the water taxis that look like great fun to help you get from A to B. Where is your favourite weekend break destination? Do you prefer city breaks or country retreats? What makes a perfect city break? Ooh… I’ve been seriously looking for a quick weekend break and this looks ideal! 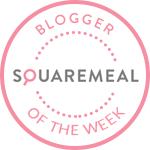 It’s such a fab destination for a weekend break – and lots of great places to eat – you’d love it, Honey! It honestly looks so fun! I think this would be a perfect trip for me and Allyn! I think you and Allyn would love Rotterdam! It’s such a fun city with great food and beautiful architecture! Oh I’m so glad!! We completely fell in love with the city. It’s a wonderful city and I definitely want to return! That’s exactly it, there has been great thought gone into the spaces which is what makes it such a lovely city to be in. And perfect for a weekend getaway! Thank you Hilary! You definitely have to make time for it next time your in Europe!! It’s such a vibrant city! Thank you Clare. The jazz festival was amazing! Such a mix of people and great fun. I think it would be the perfect excuse to visit Rotterdam! Ah, perfect timing! 🙂 It’s a really cool city to explore and you definitely need to check out the Markthal if you go! I have traveled through Rotterdam once a long time ago but it looks like next time it should be the destination. I have read a few posts recently about it and I love the architecture in particular ! We loved the mix of architecture, the skyline is full of different shapes. It’s beautiful! What a super cool city! 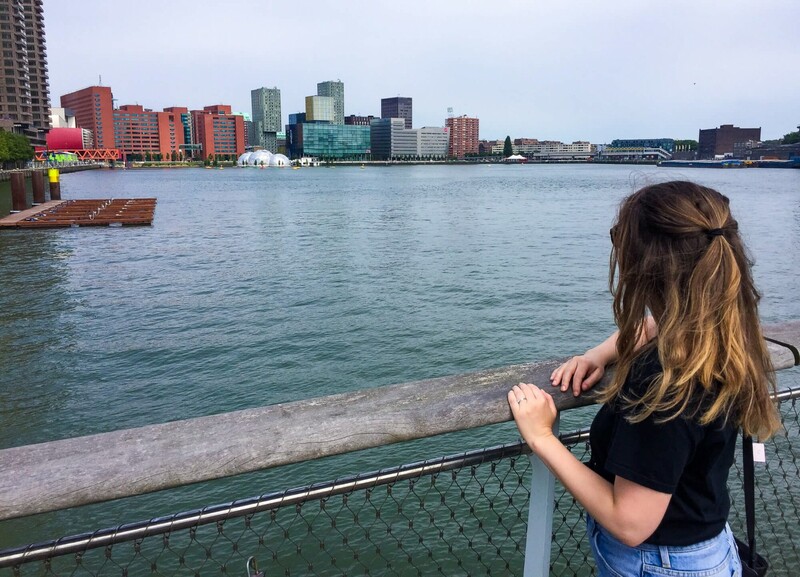 My best friend moved to Rotterdam a few years ago, but she’s never explained her new home to me whenever we go out travelling together. I now know what to do this summer when I go to the Netherlands! Going to check out the line up for this year’s jazz festival as well. It really is! Oh you definitely have to go and visit your friend, and if you have time explore more of the Netherlands. It’s such a nice country. And I can highly recommend the jazz festival! A great mix of music and people of all ages, it’s really fun! Fantastic photos- I’d never considered Rotterdam as a destination before, but I like the idea of it being so close to London. 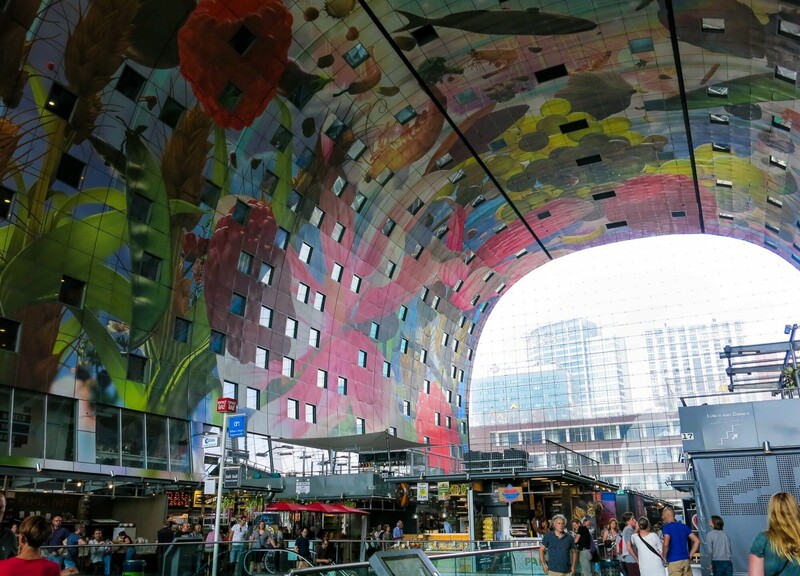 The Markthal looks awesome- its giving off a bit of a Shoreditch vibe! Thank you Hazel! It’s super close to London making it such a great weekend break and it definitely has a Shoreditch vibe to it. Lots of fun things to do and great places to eat! Thank you Ella! It’s a wonderful city and perfect for weekend trips from England. Lots to see and do and great food too! I so love Rotterdam! It’s modern and vibrant and it is always changing! Modern and vibrant are the perfect way to describe it! I loved it! We have not long finished a European backpacking trip and after this post I’m gutted we didn’t squeeze in Rotterdam. So in love with the Markthal roof and ofcourse aaall the foodie pics! 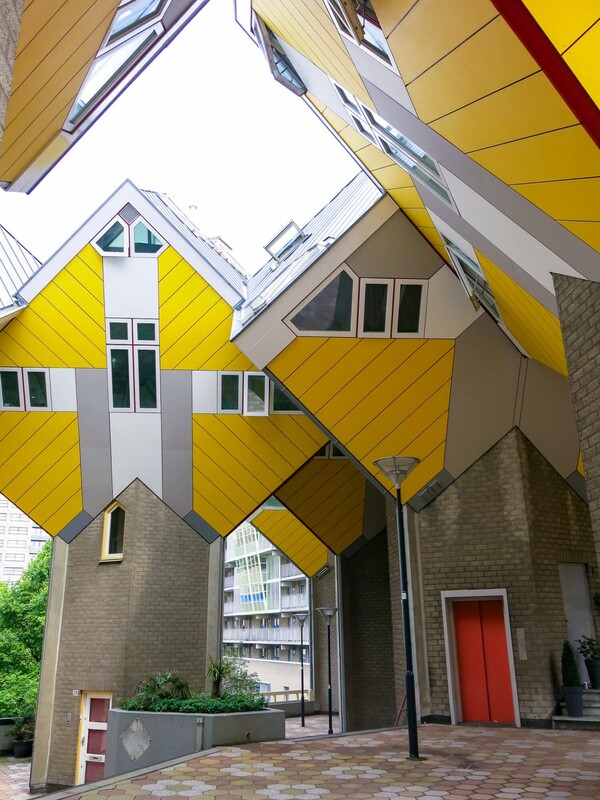 I absolutely love the architecture in Rotterdam! It’s such a vibrant city, and awesome it gets the attention it deserves! It’s wonderful isn’t it! Such an interesting skyline! Thank you Josephine! 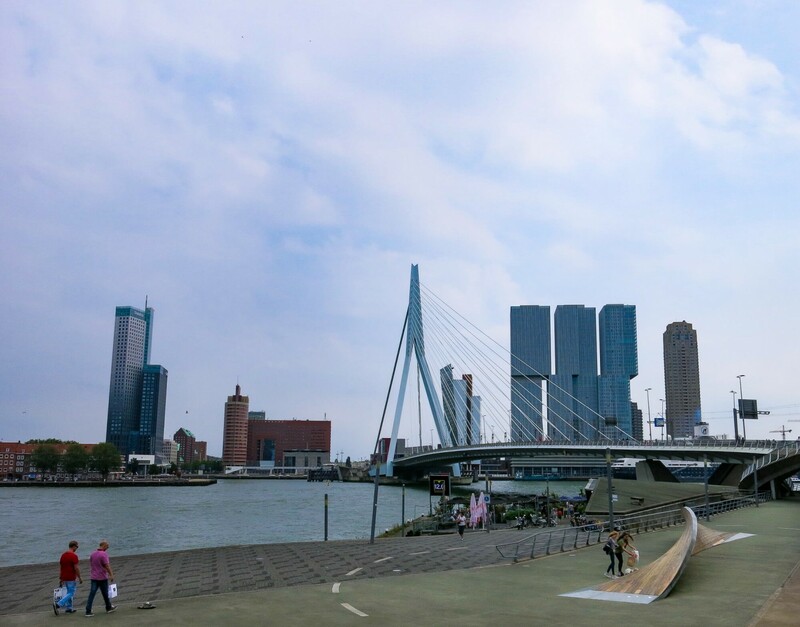 You should definitely add Rotterdam to your list, it’s a wonderful city! It’s has now become one of my favourite European cities!! I hope to go back again this year to explore it even more. Rotterdam seems so astonishing and exceptional, Vicky. It definitely has the potential to become my favorite city. How many days would be enough to see all the highlights there? It is such a great city! I think you could see most of the city with three nights and two full days. I’m hoping to go back again this year!